FILE PHOTO: Immigration and Customs Enforcement agents enter a restaurant to remove evidence in Cheektowaga, N.Y., Wednesday April 16, 2008. “Letting ICE run amok in the courthouse...directly interferes with that underlying purpose of the court system." Laura Benshoff covers the suburbs for WHYY, 91 FM. Originally from Raleigh, N.C., Laura hasn't had a southern accent in years. She moved to Montreal for college before landing in Philadelphia in 2012. (Philadelphia) — Federal immigration officers made arrests in and around courthouses in nearly one-fifth of Pennsylvania’s counties since 2017, according to a report published by Temple University Law School’s Sheller Center for Social Justice. The paper was the first in the commonwealth to pull together information on this ramped up enforcement tactic where officials detain undocumented immigrants when they arrive at unrelated court hearings as defendants. The report, based on anecdotal evidence, detailed the ways in which county court staffers and judges sometimes share information with U.S. Immigration and Customs Enforcement, ask court participants about their immigration status and coordinate probation appearances so that ICE can take someone into custody. “Letting ICE run amok in the courthouse and collaborate with court personnel directly interferes with that underlying purpose of the Pennsylvania court system, which is to administer justice,” said Temple Law professor Jennifer Lee, who supervised the research. The examples raised in the report underscore an ongoing battle over ICE’s access to local courts. Under President Trump, immigration priorities changed and enforcement in settings such as courts has increased. Although information about a defendant’s immigration status may be available to ICE independent of court staff, advocates for undocumented immigrants say using a court date as a lure hinders the justice system by making it less likely immigrants will participate as defendants, witnesses and and victims. Federal immigration officials say courthouse arrests are a safe way for law enforcement to target offenders who are in the country illegally, a violation of federal civil law. In fall 2018, Temple law students compiled information from 56 survey respondents, conducted interviews, and compiled existing accounts of collaborations between local and federal law enforcement to write the report. They confirmed at least one recent court-related arrest in 13 Pennsylvania counties: Allegheny, Beaver, Berks, Bucks, Chester, Cumberland, Delaware, Lackawanna, Lancaster, Lehigh, Montgomery, Northampton and Philadelphia. The largest number examples were from the Philadelphia area. Eleven of these counties are in the top dozen in the state in terms of immigrant population. The report does not quantify the total number of arrests made. 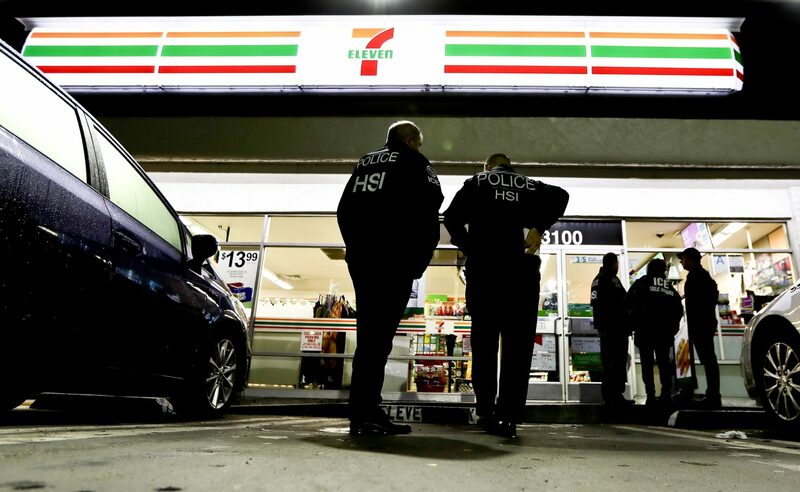 FILE – In this Jan. 10, 2018, file photo, U.S. Immigration and Customs Enforcement, ICE agents serve an employment audit notice at a 7-Eleven convenience store in Los Angeles. Attorney Rebecca Hufstader said one of her clients, who she declines to name, was attending a hearing in Berks County court in 2017 as a part of a diversionary program for violating a protection from abuse order. When it was his turn, the judge called his name and “told him he needed to wait after because there were ICE officers in the courtroom waiting to arrest him.” His criminal charges were ultimately dismissed. Some court staff also shared instances of judges seeking information about immigration status, a civil matter, in criminal court. “In Chester County, several people who work in the court system confirmed that judges in criminal cases are asking in open court those with ‘Spanish surnames’ or ‘Latinos’ about their immigration status,” wrote the report authors. Arrests detailed in the report were not limited to criminal courts. In Bucks and Chester Counties, court staff and local advocacy groups described arrests near magisterial district courts, which handle minor proceedings such as traffic tickets and landlord-tenant disputes. In one example, a Mexican man showed up to Ottsville Magisterial District Court in Bucks County to pay a ticket for driving without a license — a summary offense punishable by a $25 to $200 fine — and was detained outside the building. As WHYY has previously reported, immigrants have also been apprehended by ICE at Philadelphia’s family court. Researchers also compiled examples of probation officials in five counties coordinating with ICE to make arrests. “ICE civil immigration enforcement actions inside courthouses include actions against specific, targeted aliens with criminal convictions, gang members, national security or public safety threats, aliens who have been ordered removed from the United States but have failed to depart, and aliens who have re-entered the country illegally after being removed,” said the officials. Last year, nearly 70 former judges wrote a letter to the Acting U.S. Immigration and Customs Enforcement Director, saying courthouse arrests hamper the criminal justice system. The report asks the Pennsylvania Supreme Court to convene a task force looking into ICE access to the courts, in order to ultimately limit arrests and information-sharing.